According to the Bylaws, the Awards and Endowment Committee shall organize and implement the Society's efforts to recognize and honor those persons whose diverse efforts have enhanced the field of rural sociology and/or improved the conditions of rural people and places. The Society supports scholarship and practice to improve the quality of rural life through the distribution of funds from the Endowment. Information about RSS awards and competitions found below. The purpose of the Distinguished Service to Rural Life Awards is to recognize a person, organization, or collective who has made an outstanding contribution to the enhancement of rural life, rural people, or rural policy. Nominees should be individuals, organizations, or collectives whose activities exemplify the goals of the RSS. Nominees may or may not be RSS members. This award is intended to recognize excellence in non-academic settings, such as a non-governmental organization, government agency, or private firm. 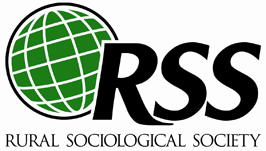 The purpose of the Distinguished Rural Sociologist is to honor one or more RSS members who have made superior career contributions to the field of rural sociology through research, teaching, extension, public service, and/or public policy. Awards are based on overall professional accomplishments in rural sociology. The purpose of the Excellence in Research Award is to recognize a RSS member who has made outstanding contributions to rural-oriented research and/or theory. Note: The contributions of the nominee to substantive area of rural-oriented research and/or theory should be emphasized. The purpose of the Excellence in Instruction Award is to recognize outstanding rural-oriented teaching by a RSS member at the graduate and/or undergraduate level. Note: Innovation in teaching and learning should be emphasized. Innovation may relate to a particular course, thematic area, population of students or pedagogical approach or technique. Evidence of impact should be provided. The purpose of the Excellence in Extension and Public Outreach Award is to honor an RSS member, working at a university or college, who has made significant contributions to extension and public outreach. This award is intended to recognize public service excellence in academic settings. Excellence centers on having made a significant impact on rural residents, rural life, and/or rural policy. A specific program or area of outreach or extension should be highlighted. The purpose of the Certificate of Appreciation is to honor RSS members who have provided outstanding service to the Society beyond the call of duty in a singular area of effort. The specific effort highlighted should not be associated with career accomplishments or service as an officer or committee chair in the Society. The purpose of the Olaf Larson Graduate Student Paper Award is to enhance the involvement of graduate students in the RSS annual meeting, and to support their professional development. The nominee must be a current RSS member. The paper must be accepted for presentation at the RSS annual meeting in the year the award is made. The paper may be co- authored with another graduate student who is a RSS member, but not with a faculty member. Papers should be of normal journal article length and format (12 pt font, double-spaced, 20-30 pages inclusive). Masters theses and dissertations will not be considered. This award includes a $300 prize, 3 nights lodging at the RSS conference, and one-year membership in RSS. The purpose of the Fred Buttel Outstanding Scholarly Achievement Awardis to recognize outstanding scholarship in the form of a book or article (alternating years for each format) that demonstrates excellence in scholarly work in the same spirit as that exemplified by the late Fred Buttel. For the award, the committee seeks nominations for outstanding scholarly books that advance the field of rural sociological knowledge. The book can have been published by any academic press, but must have been published in 2016 or 2017. Members of the Rural Sociological Society who received their Ph.D. on or after January 1, 2013 are eligible to apply for RSS Early Career Research awards. Because the size of these awards is modest, proposals will generally involve small-scale projects that will enhance opportunities for scholars to pursue expanded research efforts in the future. The Early Career Research awards have previously been made for up to $5,000.